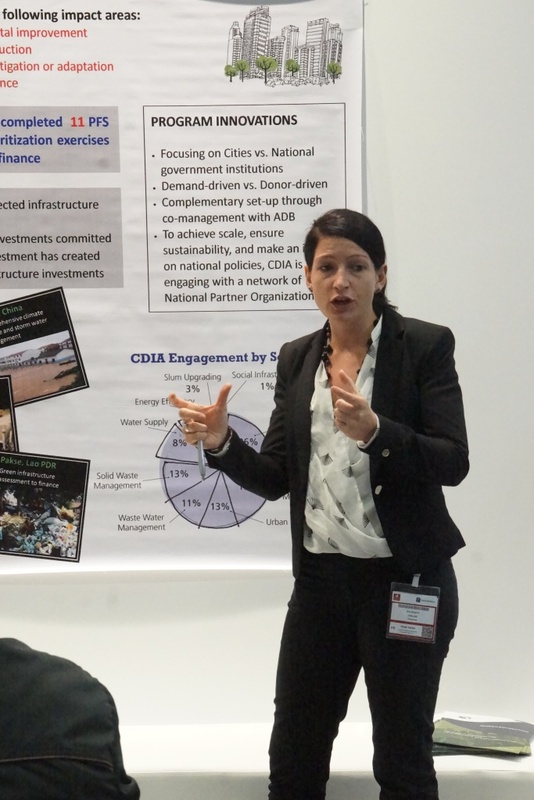 At Metropolitan Solutions 2015, we sat down with Eva Ringhof – Social Development Specialist at the Cities Development Initiative for Asia (CDIA) – and asked her about city-business financing. Below is an edited transcript of the interview. Q: From your perspective at GIZ, and looking out in Asia especially, what do you see as the trends in finance between cities and businesses? Eva Ringhof speaks in the ICLEI Lounge at Metropolitan Solutions 2015. ER: Through the CDIA, GIZ works closely with the Asian Development Bank to support cities in finding funding for their priority urban infrastructure investments. Given the limits of public funding, we are working with local, state, and national governments to leverage these public funds and attract additional financing from the private sector. We often advise cities to work with a mix of financing resources. For example, with a transportation improvement program, we help the city to develop different packages, and we suggest, for example, that the component of road construction can be covered by the public sector, possibly with support from an international financing agency, while bus supply and operation could be covered by a private operator. We see that cities are increasingly interested in Public-Private-Partnership Projects, not only because the private sector can bring in additional capital, but because the private sector often brings in operational efficiency and provides access to new technology. Q: Do you think, in general, cities are managing with the funds that they have, or do you feel that there is always a need to look elsewhere or to find out new funding from other institutions? ER: Any city will always need more funds to finance their priority infrastructure investments. This is what CDIA tells the cities: attract additional financing. Also, the city needs to have its own house in order and needs to have a healthy financial balance sheet. At the project level, the ability of the city to ensure cost recovery is crucial. So both the financials of the project need to make sense; for instance, are investment and operational costs covered through retributions? A city’s financial management should be robust to ensure cost recovery actually can take place. This requires political commitment, which is sometimes challenging.